JORN: nuevo disco "Heavy Rock Radio"
El disco será lanzado por Frontiers Music Srl el 3 de junio. BREAKING NEWS: Frontiers Music Srl is excited to announce JORN’s new album, “Heavy Rock Radio”, due for release on June 3rd! Jorn says: "The most important thing was to treat these songs with respect towards the original versions, my goal was always to think that the original artist would be honoured and find my version relevant. At the same time my intention was never to try to compete with the original song and artist, but make it a strong alternative version to enjoy. At the same time it is a well deserved homage to these artists and bands, who influenced me strongly, and I have wanted to record these songs for quite some time but was always too busy writing and recording my own songs to make it happen. Originally I had a list of 40-50 songs I wanted to do, but I had to strip it down to about 15 songs before deciding on the final tracklist. This means that there are some unfinished business musically, and I will most likely record more of these songs in the future." Since releasing the critically acclaimed Dracula "Swing of Death" album last year, Jorn has also been working on an album of brand new songs, which will be the successor to the 2013 Jorn album "Traveller", to be released in early 2017. Jorn's catalogue is getting too long to include in brief press statements, and his innovative and creative skills have led to him selling millions of albums worldwide and being a frequent entry on sales charts around the world including Billboard. Worth a mention is his years with German based MasterPlan, whom he recorded three albums with. Claimed to be the biggest selling Norwegian musical export, since the pop band A-ha, Jorn continues his rock crusade, and there are no signs of him slowing down yet. 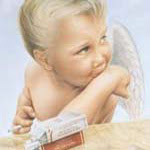 The title "Heavy Rock Radio" came quite naturally, as the sound of this album feels like if it's tailor made for any rock radio station, and while Jorn's voice can be enjoyed on more than 40 albums in different rock and metal styles, this record is a special treat which will tide over all the fans waiting for the new original album which is being worked on at the moment. Enjoy! That is why the variety of songs include everything from experimental pop of the 80's and 70's American west coast music, to more classic heavier rock. Genial! Menudo gustazo escuchar a este señor cantando esos temazos. JORN: detalles de su nuevo disco "Life on Death Road"
Frontiers Music Srl anuncia que el 2 de junio de 2017 saldrá a la venta el nuevo álbum de estudio de JORN, titulado "Life on Death Road". El álbum también marca el debut de una nueva formación de músicos alrededor del cantante noruego. Lo que viene siendo el fondo de armario o chicos para todo de la Frontiers. No los adivinaríais ni de coña. The album also marks the debut of a new lineup of very experienced and gifted musicians around the Norwegian singer. On bass is Mat Sinner (Primal Fear, Sinner, kiskesomerville) who needs virtually no introduction to European heavy metal fanatics. On keyboards and production is Alessandro Del Vecchio (Hardline, Revolution Saints), who already joined JORN for the recording of his last covers album, “Heavy Rock Radio” and was the glue that helped Jorn to create the feel and the direction for the new album. Francesco Jovino (Primal Fear) is on drums and Alex Beyrodt (Primal Fear, VOODOO CIRCLE) handles guitar. Truly a recipe for a roaring success! 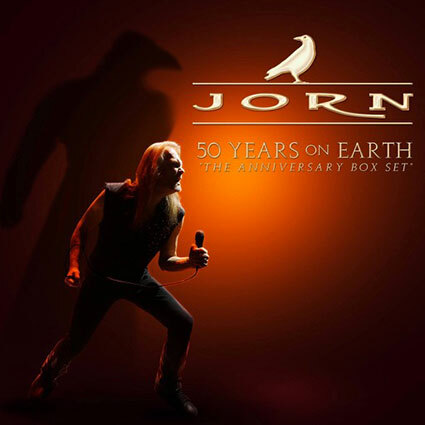 JORN: nuevo tema "Man Of The 80's"
JORN: caja 50 cumpleaños "50 Years on Earth - The Anniversary Box Set"
Aprovechando que el chaval cumple cincuenta añitos, Frontiers Music saca una caja que contendrá 12 discos. La caja además de álbumes de estudio, incluye una colección exclusiva de las mejores canciones en vivo de Jorn tomadas de sus álbumes "Live in the USA" y "Live in Black" y de sus mejores versiones. Finalmente, hay un disco con temas bonus y raros. "One Day We Will Put Out the Sun"
"When Angel Wings Were White"
"We Brought The Angels Down"
"Lonely Is The Word - Letters From Earth"
"Bring Heavy Rock To The Land"
"The Man Who Was King"
"The Day The Earth Caught Fire"
Frontiers Music Srl is honored to celebrate JORN’s 50th birthday in 2018 with the release of the ultimate JORN box set, "50 Years on Earth - The Anniversary Box Set”. Jorn Lande was born on May 31, 1968 in the heart of Norway, between massive mountains in a little town called Rjukan. The little blond Viking grew up roaming the forests and mountains and rocking out to Elvis Presley and bands like Sweet, Slade, Jethro Tull, Deep Purple, Rainbow, Free, and Black Sabbath. Eventually, he would become one of the world’s most renowned voices in rock and metal. 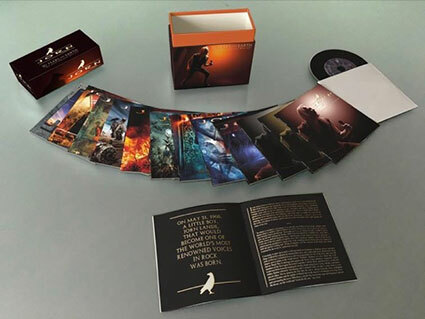 Fifty years later, a celebratory box set – a limited edition release – celebrating the artistic production of the fine Norwegian singer is prepared with the intent of closing a major chapter of Jorn’s artistic career and opening up the “second phase” of his musical journey. This attractive package also includes a beautiful booklet with handwritten notes from Jorn Lande. In Jorn Lande’s words, “I'm proud to have made it this far and to still be around and relevant. This is first of all a thanks to all the music lovers around the world who keep believing. JORN: "Lonely Are The Brave"
JORN - "Hammered To The Cross"